A debatable and hot topic these days is if iPad applications and computers actually entertain and educate. The iPad educational market is something to be reckoned with, no doubt. Many parents think that if their child, the younger the better, can navigate through a program on an iPad then they are not only self-educating but will also have a head start on their peers. Currently there is no definitive research which shows that children under the age of three benefit from educational apps. Tech EdVentures introducing his robots to my boys, and I was really surprised with how quickly my boys understood…especially being so young! That doesn’t mean that every parent, myself included, would like for their child to not only be technologically capable but advanced. Can you imagine a child, as young as five years old, learning hands-on about engineering, electronics, sensors, actuators and more? Moreover, how would you like to have your child go beyond the passive entertainment that iPad educational apps mostly offer to something that offers real world opportunity of being active learning subjects with technology. I thought the idea of robotics, what they are, how they work, would be way over a child’s head. Then when my boys had the opportunity to encounter Dr. Allen Selis, founding Director of Tech EdVentures, with his special Thymio II robots at a special Dallas Museum of Art event, I was over the moon to see firsthand that robotics is not over childrens’ head and they learn so much through the interaction.. The Thymio II, from Switzerland, resembles a Roomba, but is actually an educational robot. The Thymio II robots are interactive and have sensors that allow them to move around according to what is blocking them, or so I understood. These amazing robots have mechanic fixations which are compatible with legos, speaker, microphone, infrared remote control speakers, a large number of sensors and actuators, 2 wheels with speed control, and more. Programming of the Thymio II can be graphical or as easy as using a simple text programming language such as “Aseba” which is similar to Matlab. Actually, my three boys understood and picked up the concept of the Thymio II much faster than I did. Seriously! Have you had that feeling of excitement when your young child understood something technologically advanced but then to realize you are still trying to process? The amazing educational benefits of hands on learning with early childhood development is clear when children are interacting with the Thymio II. Tech EdVentures’ welcoming remarks on their webpage is “Where curiosity is cool. A Place where everyone gets to be themself.” They believe Science, Technology, Engineering, and Mathematics, STEM, skills are the fundamental literacy education to improve competitiveness in technology development for children as young as five years of age. Tech EdVentures is providing this technology and more for your kids through so many of their programs offered in a variety of locations and times. Robot vs the Twins: Who will outsmart who? They have a plethora of opportunities from the age of five all the way up to Code Café for teenagers. For 4-5 year olds they have a couple of different classes, from working with the Thymio II robots, to Squishy Circuits where LEDs, toy motors and batteries meet play dough and more. Children ages 8-11 can do visual programming similar to MIT’s Scratch and then Python; and children ages 10-14 can learn basic CAD designs, create digital art and print via 3-D printer. Whether you want to advance the technology skills of your child, advance their critical thinking skills or just let them geek out on computers, Tech EdVentures is the place you should check out. The have a Tech Camp Open House this Sunday, May 17, 2015; 3-4:30pm: Hands-on preview of summer: Robotics. Java art. Video games. Electronics workshop. 3-D design and print demo. 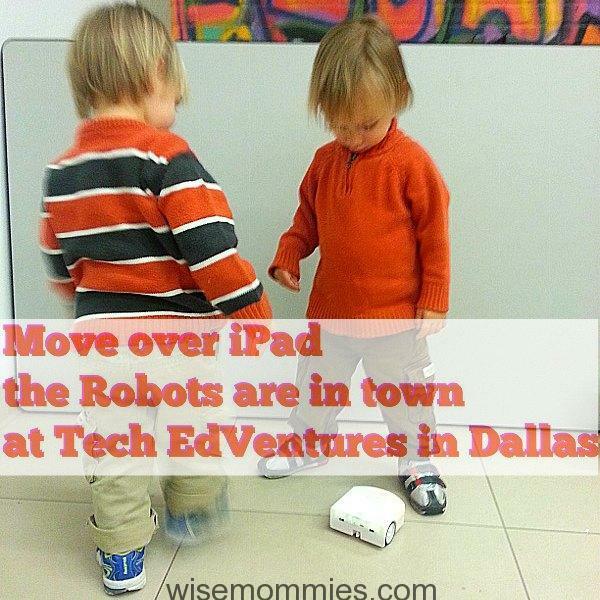 Tech EdVentures located in Dallas, TX, 17290 Preston Road.